If you have a large breed dog then you have to know everything there is about a very scary condition call Gastric Dilatation and Volvulus (GDV), often called bloat. It is the leading cause of death in large and giant breed dogs in the United States. 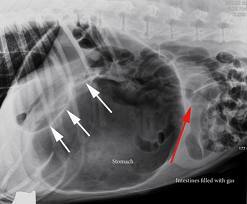 A GDV occurs when the stomach fills up with air (dilatation) and rotates on itself (volvulus). This action all but eliminates blood flow to the stomach and the tissue rapidly begins to die creating a host of horrible conditions. What is truly terrifying is GDV comes on very suddenly and without surgical intervention rapidly leads to death. Many dogs never even make it to surgery and the mortality rate for those that do is still quite high at 15-33%. Now that I have you good and scared let me give you the good news, we can prevent this from happening! By performing a simple procedure called a prophylactic gastropexy we can stop the volvulus part of the equation and eliminate GDV. First we should determine if your dog is at risk. Dogs that weigh greater than 60 pounds have a 23% lifetime risk of GDV. Especially those that are deep chested like Great Danes, Weimaraners and standard poodles. The AKC has a great list of at risk breeds on their website. Here is more good news - we are now performing the grid gastropexy technique, which is much less invasive than the traditional huge incision along of the midline of the abdomen. We make a small 2-3 inch incision just behind the last rib, reach into the abdomen and grab the stomach. It is then tacked to the inside of the body wall and the muscle and skin is then closed over the defect. This method is very quick, causes less tissue trauma that results in faster healing and decreased pain. The best time to have this performed is during your dog’s spay or neuter procedure. There is no additional down time and this procedure has very few complications. The most common ones we see are swelling under the skin or an annoying puckering of skin, both of these resolve on their own. If you have a dog that has already been fixed but you still feel is at risk it is reasonable to consider having the gastropexy done as a stand-alone procedure. When I neutered Frank we were not doing the gird technique and I didn’t want to make a large abdominal incision for the traditional gastropexy technique. Every time I see him inhale his food in less than 15 seconds I kick myself that I didn’t do the gastropexy at the time of his neuter. In the next few months I am going to put him under anesthesia again and perform the pexy. With this technique there is no reason not to protect your dog and give yourself some piece of mind.